There’s been a lot of cooking (and eating!) going on in our house. Life caught up with me this weekend, and I got a bit behind in my posts. So I wanted to bring you up-to-date on the meals I’ve made over the past couple of nights. Let’s start with two nights ago, when I was out with the kids all day and came home at 4pm with no dinner plan in mind. 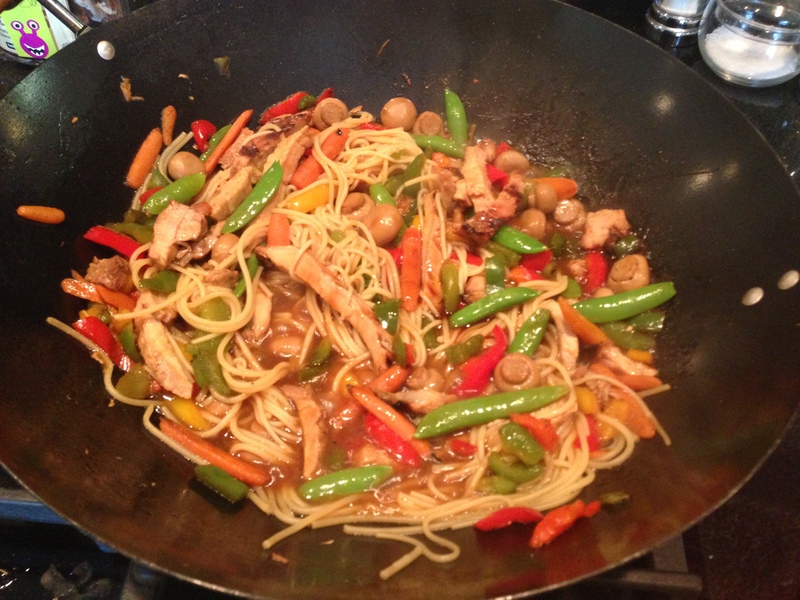 So I grabbed whatever was in my refrigerator, threw it in my Wok and came up with this concoction: Pork & Noodle Stir-Fry. The main ingredient was simply the leftovers from when I made Grilled Pork Chops with a Honey Glaze two nights before. Thinly sliced. Whatever veggies I had on hand: frozen sliced green, yellow & red peppers, a can of button mushrooms (drained), baby carrots, snow peas. Was it a hit? Yes and No. Earlier that day, my kids were at a taste-testing event for our public school system (more on that in a future post) and had eaten some foods that are not part of our usual repertoire. So, by the time our long & busy day was over, the kids were (I think) ready for some chicken nuggets or something more ‘kid-friendly.’ But they still liked this meal… particularly the noodles… and ate their dinners. My husband also really liked this. I’ve made Tofu Stir-Fry this way before with similar success, so I would serve it again. Sifting through my kitchen to find the makings for the Pork Noodle Stir Fry inspired me to try to use up everything in my refrigerator and freezer. 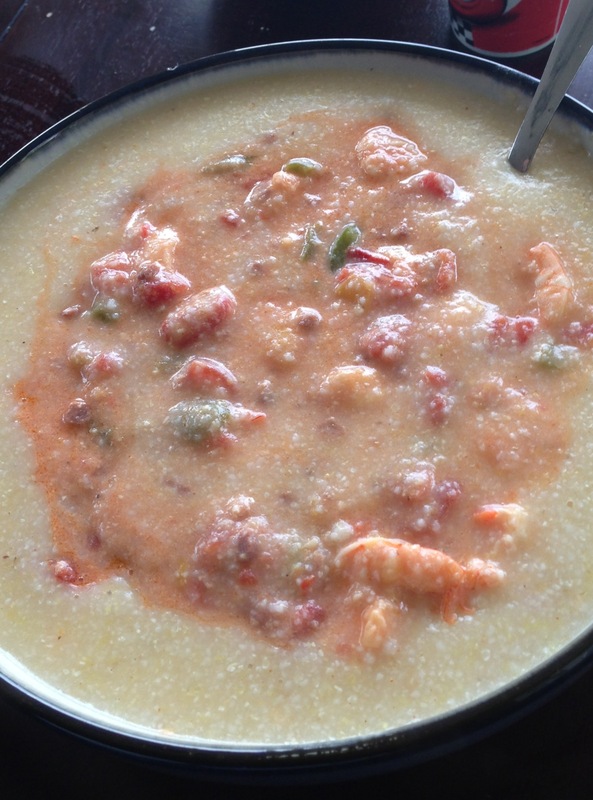 That’s when I found the fixin’s for this menu: shrimp in the freezer, grits and diced tomatoes in the pantry. Trouble is: I’m trying to lose a few L-B’s and Shrimp & Grits isn’t always considered the most low-cal meal. That’s when I found Bobby Dean’s lightened-up version of his mom’s Shrimp and Grits recipe. It’s more tomato-based, less cheese. I used turkey bacon instead and omitted the hot sauce. My kids tend to love shrimp dishes, and this was well-received. Even my 6 year old who is less-than-enthusiastic about other recipes for Shrimp and Grits that I’ve tried, ate this with little grumbling. 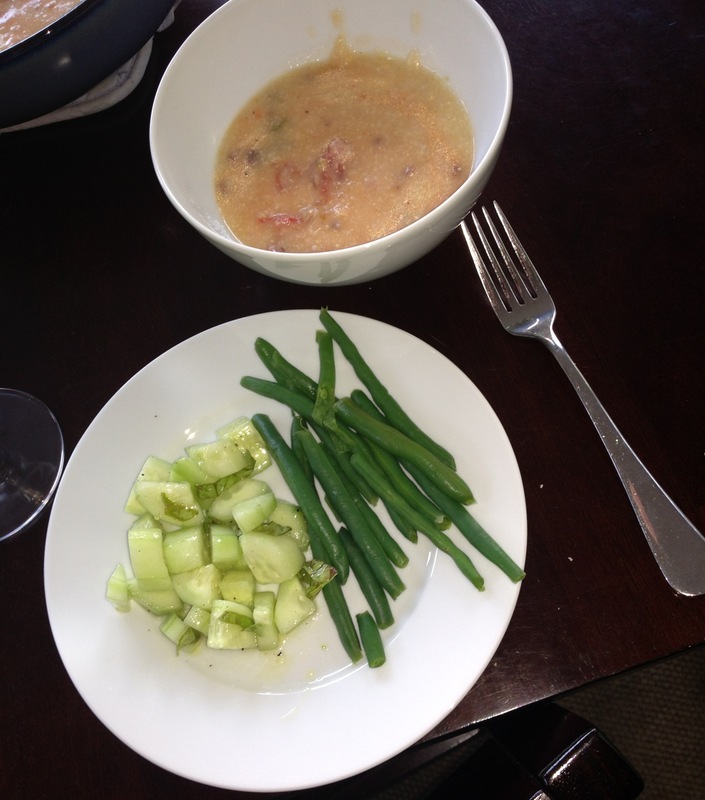 The steamed green beans — well, that’s all they were. The Cucumber Salad was the most-favored dish on this menu. My kids all LOVED this. I based mine on this Ellie Krieger recipe. The biggest differences in mine: 1) I didn’t have any red onion, so that was left out, and, 2) I substituted dill for the fresh basil from my herb planter. Oh — and I used regular cucumbers, which I tend to always have on hand in my fridge. Saying my kids loved this is an understatement. 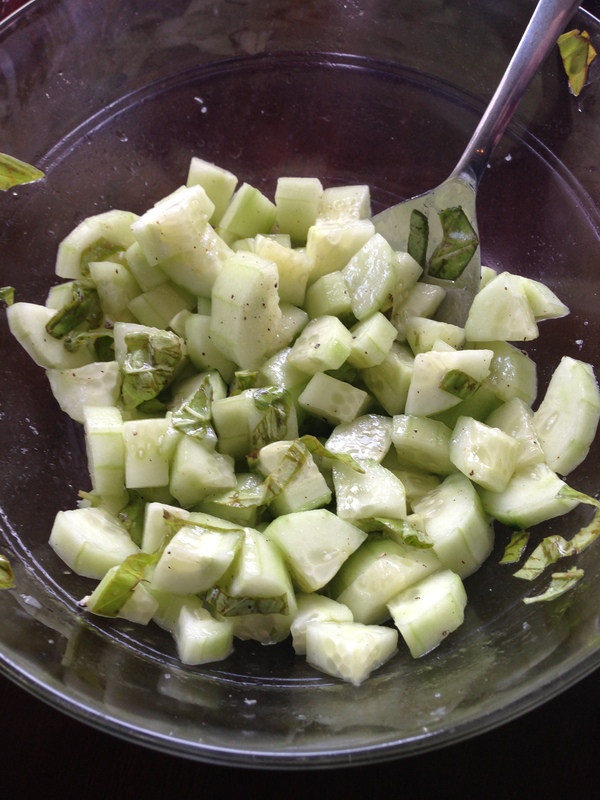 If your kids like cucumbers – give it a try. It’s definitely a keeper in our house! That brings us to — last, but not least — tonight’s super-simple, super-yummy meal. 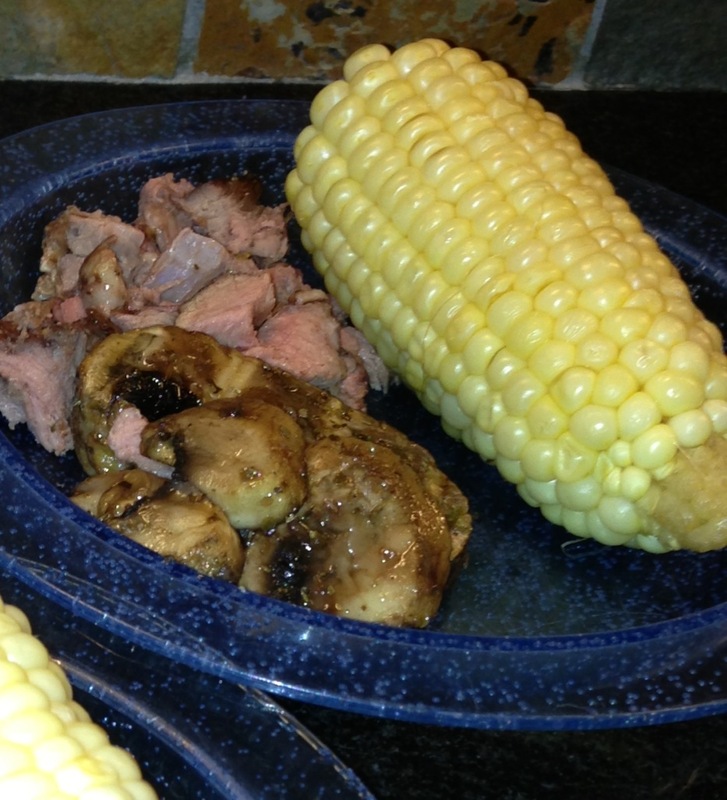 All of the ingredients were on sale at the grocery store today, including the boneless, butterflied leg of lamb. So I just couldn’t resist. 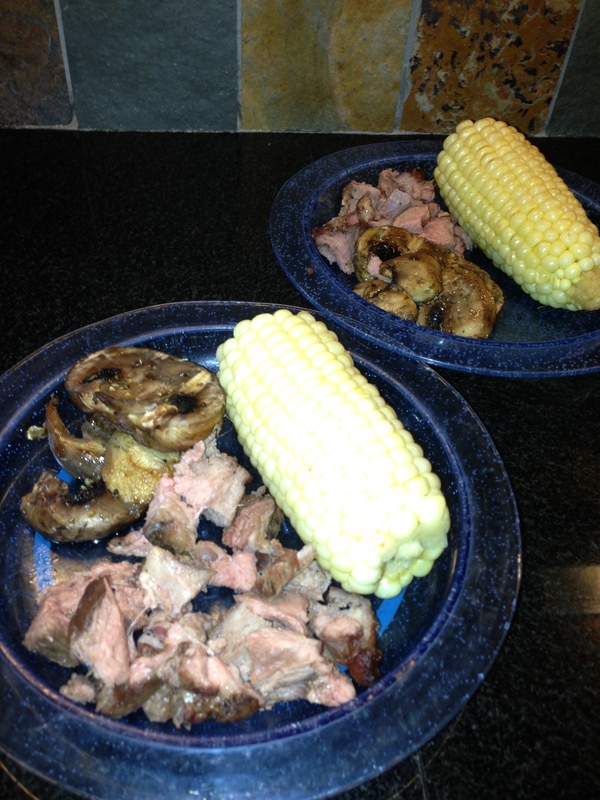 Leg of lamb is my absolute favorite meal. And grilling it makes it less messy than it is when you roast it. Not to mention it’s so much better to grill when it’s 82 degrees outside! 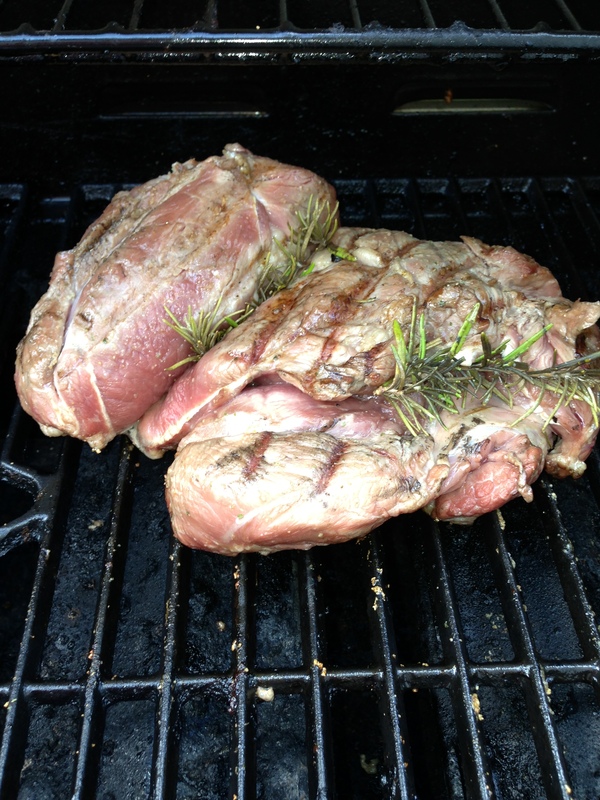 put a couple sprigs of fresh rosemary on top, sort of tucking them into the crevasses of the lamb. The kiddos love this. My 6yo wanted the leftovers in his lunchbox for tomorrow. He’ll have to arm wrestle my hubby for them. So there you have it — three nights of dinner in one extra-long post.